How does the use of military drones affect the legal, political, and moral responsibility of different actors involved in their deployment and design? 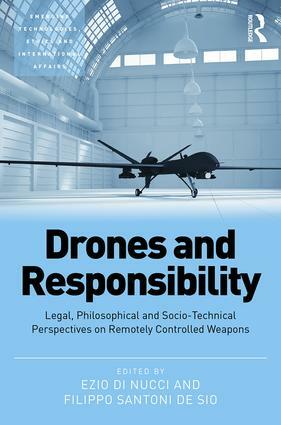 This volume offers a fresh contribution to the ethics of drone warfare by providing, for the first time, a systematic interdisciplinary discussion of different responsibility issues raised by military drones. The book discusses four main sets of questions: First, from a legal point of view, we analyse the ways in which the use of drones makes the attribution of criminal responsibility to individuals for war crimes more complicated and what adjustments may be required in international criminal law and in military practices to avoid ’responsibility gaps’ in warfare. From a moral and political perspective, the volume looks at the conditions under which the use of military drones by states is impermissible, permissible, or even obligatory and what the responsibilities of a state in the use of drones towards both its citizens and potential targets are. From a socio-technical perspective, what kind of new human machine interaction might (and should) drones bring and which new kinds of shared agency and responsibility? Finally, we ask how the use of drones changes our conception of agency and responsibility. The book will be of interest to scholars and students in (military) ethics and to those in law, politics and the military involved in the design, deployment and evaluation of military drones. INTRODUCTION "Learning Anew: Asia in IR and World Politics,"
Ezio Di Nucci is Associate Professor of Medical Ethics at the University of Copenhagen, having previously taught at the University of Edinburgh (where he received his PhD in 2008), the University of Stirling, University College Dublin and the University of Duisburg-Essen (where he received his Habilitation in 2014). Ezio works mainly in ethics, bioethics and the philosophy of action. Filippo Santoni de Sio is Assistant Professor of Philosophy and Ethics of Technology at Delft University of Technology. He received his PhD in Philosophy at the University of Turin in 2008. He has already published one monograph, one edited collection and more than thirty papers on moral and legal responsibility, the ethics of cognitive enhancement, and robot ethics. He is co-founder and secretary of the International Society for Responsible Robotics.